A team of Purdue University researchers has been awarded a $1 million W.M. Keck Foundation grant to develop a new type of imaging technology for cell and tissue analysis. Central to the concept is the invention of a new way to perform in-vivo spectroscopy, or using a pulsing laser light to determine the precise chemical content of tissues in living organisms. "The Keck Foundation grant provides vital funding to boost research into this innovative approach," said Purdue Provost Debasish "Deba" Dutta. "This Keck platform has the potential to resolve the complex machinery of a live cell, representing an advanced medical tool to improve human health." The lead researcher is Ji-Xin Cheng, a professor in Purdue's Weldon School of Biomedical Engineering and Department of Chemistry and scientific director of Label-Free Imaging at Purdue's Discovery Park. "This work is potentially very important because if we know the chemical content of tissue we can do early detection of disease with biomarker sensitivity, and this is not possible with current medical imaging technologies," Cheng said. It is currently not practical to use in-vivo spectroscopy – or the analysis of how light interacts with molecules in living tissue – because photons scatter when light shines on tissues, making for inefficient detection of the photons. "Our technique is designed to overcome this problem," said Cheng, who is working with other team leaders Andrew Weiner, the Scifres Family Distinguished Professor of Electrical and Computer Engineering; and Mingji Dai, an assistant professor in the Department of Chemistry. The new in-vivo imaging technology hinges on a technique called modulation-multiplexed stimulated Raman scattering microscopy. "We will convert Raman spectroscopy, generally used to study molecules in solutions or fixed tissues, to an in-vivo imaging platform that is able to monitor how a living cell executes its functions in real time," Cheng said. "This allows us to get a spectrum of individual molecules, revealing the chemical composition of the tissues." 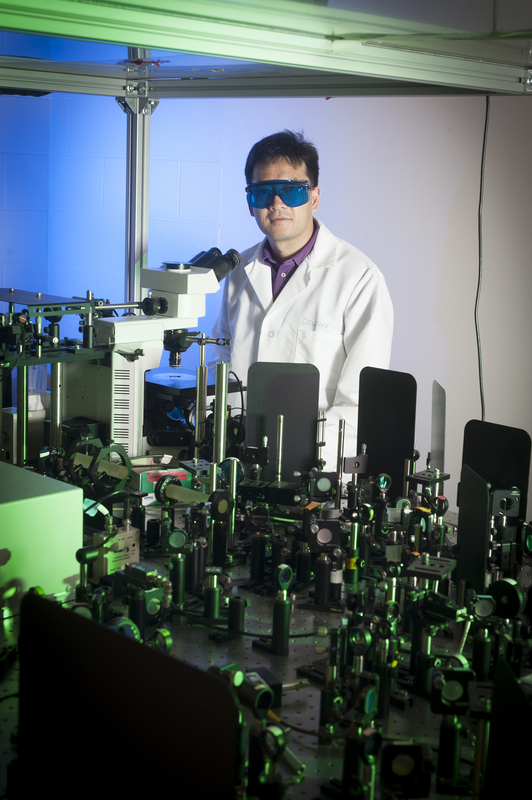 The Purdue approach is to superimpose a code – or frequency modulation – onto each color of the spectrum in light emitted by a fast-pulsing laser. Photons containing this code could be retrieved after the laser light interacted with tissue, revealing the tissue's composition. "Even though the scattering of light interacting with tissue changes the direction of photons, the frequency modulation of each color does not change," Cheng said. "This could allow us to code the laser light for detection of photons using a large detector placed near the specimen or organism being imaged." The frequency modulation will be performed with an instrument invented by the Purdue researchers.